Is magnetic field an important guiding force for gas accreting to supermassive black hole (SMBH) — for example, the one that our Milky Way Galaxy hosts? The role of magnetic field in this subject is little understood and trying to observe it has been challenging to astronomers. Researchers at the Academia Sinica Institute of Astronomy and Astrophysics (ASIAA), Taiwan, led by Dr. Pei-Ying Hsieh, have utilized a measurement of high resolution data by using the instruments on the James Clerk Maxwell Telescope (JCMT). Their result provides clear evidences in showing that the orientation of the magnetic field is in alignment with the molecular torus and ionized streamers rotating with respect to Sagittarius A* – the black hole our home galaxy hosts. The findings are published in Astrophysical Journal in 2018 August 2nd (2018, ApJ, 862, 150). Color-composite images of the SMA map tracing the molecular gas of the CND (blue) and the Very Large Array (VLA) 6 cm map tracing the mini-spiral (red). The magnetic field of the JCMT-SCUPOL data and the model are overlaid with the white segments in the upper right and low left panel, respectively. The location of SgrA* is labeled with the black cross. The CND is a molecular torus (ring) rotating with respect to the supermassive black hole SgrA* in our Galaxy. The mini-spiral is hypothesized to be originated from the inner edge of the CND. The alignment of the magnetic field line along with the CND and the mini-spiral tells us that they are linked with a coherent magnetic field. The team found the magnetic field is able to guide the ionized particles from the CND to the mini-spiral, which suggests a picture the footprint of inflow near SgrA*. In the lower right panel, the latest dust polarization data taken in 2017 measured with the new instruments POL-2 installed in JCMT is shown. The magnetic field is shown with the white segments. An improved spatial coverage and sensitivity clearly reveal the connection between the CND and the mini-spiral at even higher spatial sampling than the JCMT-SCUPOL data, which confirm the picture the team proposed. Sagittarius A* (SgrA*), being the closest SMBH in our home in the universe, the Milky Way Galaxy, has been targeted by many scientists to understand the nature of gas accretion in the past decades. Observing the gas accretion onto SMBH is critical to help us to understand how it releases tremendous energy. The circumnuclear disk (CND) is a molecular torus rotating with respect to SgrA*, within which are the ionized gas streamers called mini-spiral (also called SgrA West) filling the molecular cavity. The mini-spiral is hypothesized to be originated from the inner edge of the CND. The CND, being the closest “food reservoir” of SgrA*, is therefore critical on the understanding of the feeding of SgrA*. However, looking for the physical evidences to connect the CND and the mini-spiral puzzles astronomers since they were discovered a few decades ago. Intensive measurements of dynamical movements orbiting SgrA* have been done in the past decades, but another important force – the magnetic field – is rarely probed. This is solely because the weak polarized signal generated by the magnetic field from dust emission is difficult to measure. However, the magnetic field is expected to be important for material orbiting within and around the CND as the magnetic stress acting on the rotating disk can exert a torque to extract angular momentum from rotating gas, and thus drive gas inflows. Besides, The magnetic tension force is also possible to draw the gas back from the gravitational pull. Taking advantage of excellent atmospheric conditions of Mauna Kea summit at 4000 m, and large aperture size of the JCMT (15 m in diameter), the submillimeter polarization experiments were successfully obtained toward the Galactic Center to understand the role of magnetic field. The team utilized the dust polarization data obtained by the JCMT-SCUPOL instrument to image the orientation of the magnetic field. A detailed comparison with higher-resolution interferometric maps from the Submillimeter Array (SMA) reveals that the magnetic field aligns with the CND. Moreover, the innermost observed magnetic field lines also appear to trace and align with the mini-spiral coherently. This is the first attempt to reveal the footprint of inflow linking the CND and the mini-spiral since they were discovered a few decades ago. The comparison of the model and data reinforces the key idea that the CND and the mini-spiral can be treated as a coherent inflow-system. These observation results were published as Hsieh et al. 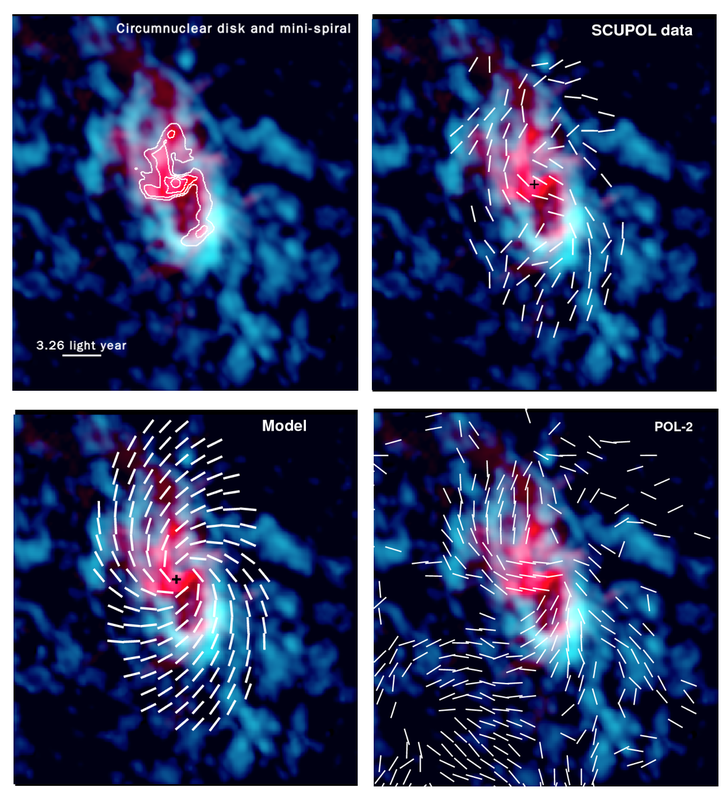 “A Magnetic Field Connecting the Galactic Center Circumnuclear Disk with Streamers and Mini-spiral -Implications from 850 micron Polarization Data” in the Astrophysical Journal (published in the Astrophysical in August 2nd). This research is supported by the Ministry of Science and Technology (MoST) of Taiwan through the grants MoST 105-2811-M-001-141, MoST 106-2811-M-001-136, MoST 104-2119-M-001-019-MY3, MOST 105-2112-M-001-025-MY3, Academia Sinica Career Development Award, and the National Research Foundation of Korea (NRF) grant funded by the Korea government (MEST; No. 3348-20160021).